First, measure the width, followed by height (preferably using a millimetre ruler or tape measure). Select the size closest to your picture and this will take you directly to the correct category where you can buy a frame. If your picture is not a close match to any sizes listed below, do not worry, proceed by finding the next best match and we just make the frame up to order based on your custom size. OTHERWISE, you are most welcome to request a quote using our Custom Quote Form and we'll respond as soon as we can. *We do not go much larger than this as the logistics of shipping become impractical. 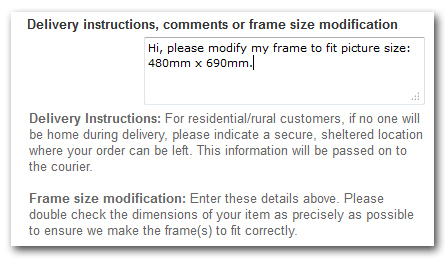 Once you've picked your frame and come to the Checkout, enter your measurement into the Comments Box, our production team will pick this up when they make your order and make the size change at no extra cost. If you need to convert inches to millimetres please use our Size Conversion tool. Please Contact Us or call free 0800 372 633 during business hours and one of our team will be happy to help.